Has pain sidelined you from playing the sports you love? Missing the game you used to love? 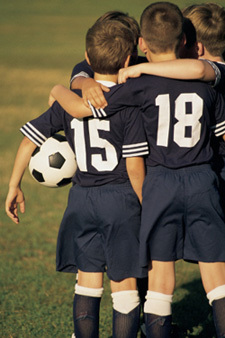 One of my patients, who is in his mid-50s, grew up playing soccer from a young age. It’s in his blood, and he just loves it. He currently plays in a master’s league, but about six months ago, he hurt his knee. Physical therapy made a difference but he still wasn’t able to get back on the field and had to play goalie instead. Although he’s a good goalie, he really wanted to be back on the field and running around. In addition to his knee pain, he also had some problems in the lower part of his spine and upper back. His job in finance requires him to sit at the computer for long periods of time. Sitting for long periods of time created a lot of postural imbalances in his spine. So, I started working on his posture and began to work out the imbalances in his spine. The nervous system was causing muscles around the knee to misfire, so the muscles weren’t firing in sequence. When the muscles don’t fire in sequence, they work against one another, and that will increase the stress in the joint. For example, if your quad muscle and the muscle in the back of your leg are not synergistically firingthen t he leg doesn’t work as well. Through chiropractic care, I got the nervous system to start coordinating the function of the muscle better. This patient is now back on the field running around and scoring goals instead of saving them. It’s so gratifying to see someone back to doing what they love in life! If pain is keeping you from the sports you love, we invite you to speak with us about how chiropractic can benefit you!